Unitag founded in Toulouse (France) in 2011 is a blend of innovation, technological prowess and avant-gardism that have matured extensively over the years. 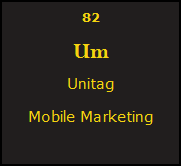 Unitag is essentially is an all-in-one tool for Mobile Marketing Campaigns which encompass a wide variety of services, modern features like the NFC, Image recognition and QR codes. Unitag have clients in 55 countries and is used by many International established companies with activities in the four corners of the globe. The French establishment aims to broaden its operations in 2015 and reach a global industry dominance with continued efforts to bring modern technologies to its clients.